In 1410 in Constance, Germany, the beautiful Marie Schärer’s luxurious life as a merchant’s daughter is destroyed when her ambitious father arranges her marriage to a lawyer from the Black Forest named Rupert Splendidus. Her childhood sweetheart warns her of the attorney’s sly character and is tragically proven right the day before the wedding, when Rupert accuses Marie of unimaginable behavior and has her thrown into a dank dungeon, where she is brutally attacked by his henchmen. Unfairly condemned and banished from her home, Marie is forced to become a wandering prostitute to survive. The clever and kind Hiltrud befriends Marie, and the strong-minded pair sets out on spirited adventures—bedding counts, meeting scoundrels, and tricking foes—as Marie plots the ultimate revenge on the men who stole her honor and her family’s fortune.Set against a richly detailed historical backdrop, this is the dramatic tale of one woman’s quest for vengeance, redemption, and real love. 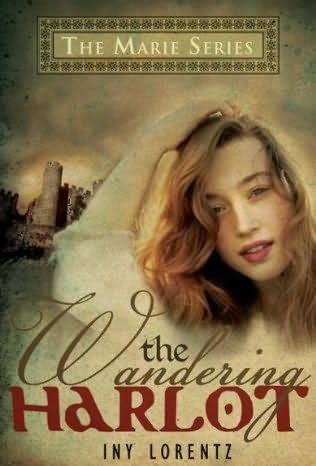 The Wandering Harlot is the first of a two book series about a young woman named Marie Schärer. Her mother died in childbirth, so she is the only child and heir of her wealthy merchant father, Matthis Schärer. When Ruppertus, the son of a count, asks for hand in marriage, Matthis is eager to see her daughter wed to him. But Ruppertus is not an honest man and before the wedding he unjustly accuses Marie of not being a virgin. She is thrown in prison where she is brutally raped, thereby proving she is no longer a virgin. It is no surprise she loses the court case. Ruppertus is allowed to keep her rich dowry and even takes possession of her father’s home. Marie is brutally whipped and then forever tossed and banished from the town. Her father is a broken man. Near death, she is found by a prostitute and has no choice but to take up the profession in order to survive. It is either that or starve. Marie vows to exact on revenge on Ruperttus and his family who have a reputation of using fraudulent mean to acquire wealth and land and property from others. The book’s opening chapters are extremely gripping, but then the plot slows a bit in the middle of the story, gaining momentum once more towards the end. The story has a very realistic feel and is written with flowing prose. This is a tale of great loss and revenge, with a touch of romance added into the plot. It does not shy away from the brutality of life in the Middle Ages and the lack of justice as it pertains to the plight of women. With plenty of twists and conflicts, it kept me interested until the end. An enjoyable story of one woman’s perseverance in the face of adversity.